Residents in the city of Nanchang, in southeastern China, long ago gave up on the idea of getting a real ambulance using the country’s official emergency hotline. “They won’t show up. They’re too busy to show up,” explained a security official at a local hospital to the Nanchang Evening News newspaper. He quickly demonstrated how one really gets help, using his cellphone to summon a lanky man to negotiate an ambulance transportation deal. No patients with heart problems would be allowed, extra charges would be levied if the ventilator was used, and for 800 yuan (about $124) trained nurses from the hospital would come along. Costs? About 50 yuan ($7.50) per mile. Unofficial ambulance services like that in Nanchang operate across China, filling a much needed gap in what the health care system—nominally public, but in practice pay-as-you-go—has failed to provide. These rogue operators suborn emergency hotline workers with kickbacks, advertise their services prominently, and readily use hospital facilities. While an ambulance service is at least rendered, the fly-by-night nature of the operation and the lack of medical expertise of the ambulance staff have become a serious cause for concern in China. Nanjing, a bustling modern city and an ancient Chinese capital, had a population of 8 million in 2013 according to official estimates. Yet the people of Nanjing have access to only 50 sanctioned ambulances. That’s 110 ambulances short of official requirements—health authorities stipulate that every city should have one ambulance per 50,000 people. But Nanjing residents are still covered. 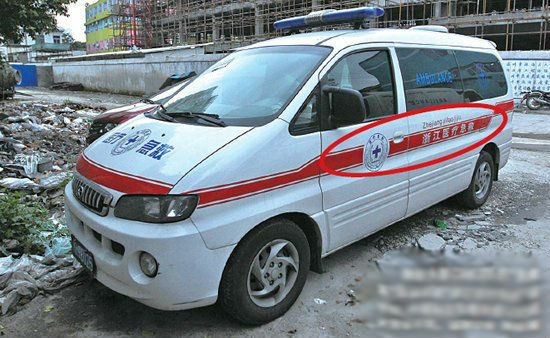 “I reckon that there are twice as many rogue vehicles as official ones,” an insider to the unofficial ambulance industry told Chinese news portal Sina in March. There seems to be an abundance of unregistered ambulances in Beijing, too. In February, Mr. Lu, a resident of Zhangjiakou in Hebei Province near Beijing, secured the services of a rogue operator to ferry his niece, who had an outpatient procedure, and his family home at the rate of 5,000 yuan (about $770) for 124 miles, according to Sina. Their “ambulance” broke down on the highway, but within two hours, another private ambulance spotted the stranded family on the roadside and agreed to drive them the rest of the way. A Sina reporter who toured a hospital in Beijing found dozens of posters advertising ambulance services stuck on doors of the intensive care unit. Some co-opted the official emergency hotline number, 120, in advertising their services. “‘120’ Emergency Station Long Distance Medical Treatment Group,” one poster said, with its own phone number underneath. Rogue ambulance operators are able to brazenly tout their services because there is no law regulating them in many places in China. 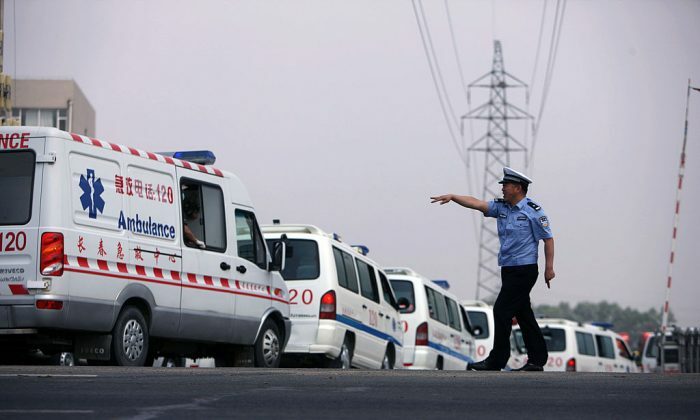 Beijing is still deliberating a draft law that will heavily fine unregistered ambulances, while the city of Changsha in central China only passed legislation targeting such vehicles in December 2015. In Nanchang where there is no legislation, the rogues have been paying fees to park in hospital compounds, and hospital security staff are left helpless. “We can’t properly deal with them,” Mr. Wang, the security director at the largest hospital in the city, told Nanchang Evening News. Given the general shortage of ambulances, having the rogues around seems like a win-win solution for the regime and the people. The only problem is that they’re often woefully underqualified. Rogue ambulances sometimes bear the same markings as their registered counterparts—the Red Cross logo, blue ambulance sticker markings, and even proper medical equipment—but their staff usually don’t have any medical training. For instance, the doctor in the ambulance that ferried Mr. Lu from Hebei didn’t know how to operate the ventilator, according to Sina. Ditto the doctor and two medical workers on board the ambulance carrying 40-year-old Mr. Huang from Wenzhou to Hangzhou in 2013: Not only could they not set up the ventilator, but they began to panic when Mr. Huang’s lungs started hemorrhaging mid-journey. It gets riskier for patients who board rogue medical vehicles that don’t look like ambulances. In September 2014, a patient and three family members died of carbon monoxide poisoning while traveling in the back of a funeral hearse that was reappropriated for ambulance work, according to Beijing Evening News. Investigations revealed that the vehicle was part of a fleet of 21 rogue ambulances owned by a police officer. Being renegades, unlicensed operators have no qualms about interfering with or hijacking the official ambulance service. 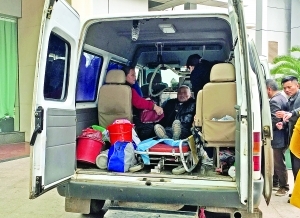 In October 2015, rogue operators had prevented a woman who received treatment for burns at a hospital in the southern province of Yunnan from boarding a licensed ambulance to go home, according to Yangguang News. After accusing the bona fide operator of harming their business interests, the frauds smashed the front and rear windshields of the real ambulance vehicle before fleeing the scene. Other rogues prefer a more subtle approach. 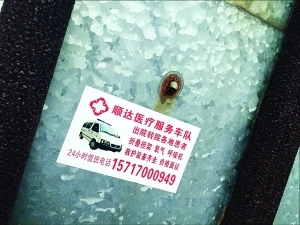 According to a 2014 report by Sina, several “120” hotline operators in the port city of Wenzhou were found to be in league with the ambulance service of a local orthopedics hospital. Over a five-year period, they sold emergency call information to rogue operators for kickbacks of about 20 percent of the ambulance fee. The racket was only busted in April 2013 when the patient Mr. Huang nearly died from suffocation and internal bleeding, as noted earlier in this story. Chinese citizens often take to Chinese social media to express outrage whenever cases of unlicensed ambulances are reported in mainland press—but sometimes, they’re just thankful that any service is available at all. Many lament the existence of yet another counterfeit product in China, comparing the rogue ambulances to the infamous poisoned milk powder scandal in 2008, the use of gutter oil in cooking by unethical food hawkers, and the recent case of hospitals using expired vaccines to inoculate children. Others hint at the culture of corruption in China. A popular theory being floated is that hospital directors and medical personnel are boosting their salaries by running fake ambulance rackets. Some feel that the Chinese regime is directly responsible for the proliferation of rogue ambulances, and that the rogues, while an imperfect solution, are at least an option.